STEPANAKERT (Artsakhpress)—President of the Nagorno-Karabakh Republic Bako Sahakyan visited the Nor Seysulan village in the Martakert region on Friday, where he laid a wreath a monument commemorating soldiers lost during the Artsakh Liberation War, and to attend the opening of a new kindergarten in the village. 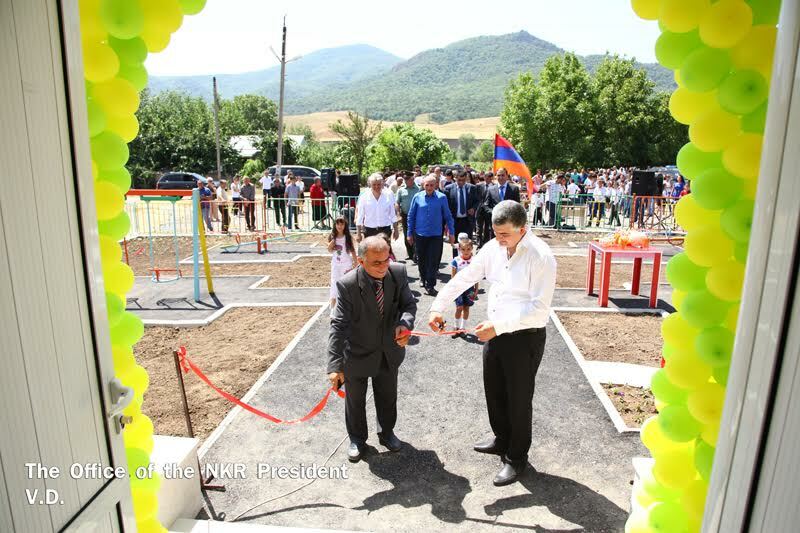 Sahakyan stated that widening the network of pre-schools in the countryside was one of the priorities of the state, and everything possible would be done to have kindergartens in rural areas correspond to contemporary conditions. Sahakyan expressed his gratitude to philanthropist Vahagn Khachatryan from Russia for implementing the projects, adding that constant support delivered by him to his native village was an exemplary manifestation of patriotism. Prime Minister Ara Haroutyunyan and other officials accompanied the President. Earlier on Wednesday, President Sahakyan visited a new water reservoir being built on the intersection of the Hagari and Aghavno rivers in the Kashatagh region of Artsakh. Sahakyan stressed the significance of the reservoir for the development of agriculture in the region, adding that its exploitation would increase the area of irrigated areas and power generation. Sahakyan thanked philanthropist from the diaspora Vardan Sermakes for his hands-on involvement in the implementation of the project. Sahakyan noted that the Kashatagh region has faces serious water shortage issues, and that the state would continue to pay special attention to their usage, strictly maintaining environmental protection norms. The President then visited the village of Arakel in the Hadrout region, where he attended a concert of various Artsakh bands. The President noted that organization of such events in the countryside contributed to the enlivening of cultural life there. Good! And after all of these developments in Artsakh our body-body smiley face James Warlick wants our heroic Artsakhtsis to return liberated lands to Genocidal Turkey and Azerbaijan, he must be smoking weed! Armenians are not and will not even give back an inch of our blessed liberated lands to any body just because the United States and or Russia want to buy friendship with the Genocidal Turkey and Azerbaijan at the expense of Armenians and Artsakh. The answer is no and it has always been no to the stupid foreign diplomats.